Spatial disorientation specifically refers to the lack of orientation with regard to the position, attitude, or movement of the airplane in space. The body uses three integrated systems that work together to ascertain orientation and movement in space. All this information comes together in the brain and, most of the time, the three streams of information agree, giving a clear idea of where and how the body is moving. Flying can sometimes cause these systems to supply conflicting information to the brain, which can lead to disorientation. During flight in visual meteorological conditions (VMC), the eyes are the major orientation source and usually prevail over false sensations from other sensory systems. When these visual cues are removed, as they are in instrument meteorological conditions (IMC), false sensations can cause a pilot to quickly become disoriented. The vestibular system in the inner ear allows the pilot to sense movement and determine orientation in the surrounding environment. In both the left and right inner ear, three semicircular canals are positioned at approximate right angles to each other. [Figure 17-3] Each canal is filled with fluid and has a section full of fine hairs. Acceleration of the inner ear in any direction causes the tiny hairs to deflect, which in turn stimulates nerve impulses, sending messages to the brain. The vestibular nerve transmits the impulses from the utricle, saccule, and semicircular canals to the brain to interpret motion. The somatosensory system sends signals from the skin, joints, and muscles to the brain that are interpreted in relation to the Earth’s gravitational pull. These signals determine posture. Inputs from each movement update the body’s position to the brain on a constant basis. “Seat of the pants” flying is largely dependent upon these signals. Used in conjunction with visual and vestibular clues, these sensations can be fairly reliable. However, the body cannot distinguish between acceleration forces due to gravity and those resulting from maneuvering the aircraft, which can lead to sensory illusions and false impressions of an aircraft’s orientation and movement. Under normal flight conditions, when there is a visual reference to the horizon and ground, the sensory system in the inner ear helps to identify the pitch, roll, and yaw movements of the aircraft. When visual contact with the horizon is lost, the vestibular system becomes unreliable. Without visual references outside the aircraft, there are many situations in which combinations of normal motions and forces create convincing illusions that are difficult to overcome. Prevention is usually the best remedy for spatial disorientation. Unless a pilot has many hours of training in instrument flight, flight should be avoided in reduced visibility or at night when the horizon is not visible. A pilot can reduce susceptibility to disorienting illusions through training and awareness and learning to rely totally on flight instruments. A condition called the leans, is the most common illusion during flight and is caused by a sudden return to level flight following a gradual and prolonged turn that went unnoticed by the pilot. The reason a pilot can be unaware of such a gradual turn is that human exposure to a rotational acceleration of 2 degrees per second or lower is below the detection threshold of the semicircular canals. [Figure 17-4] Leveling the wings after such a turn may cause an illusion that the aircraft is banking in the opposite direction. In response to such an illusion, a pilot may lean in the direction of the original turn in a corrective attempt to regain the perception of a correct vertical posture. The “coriolis illusion” occurs when a pilot has been in a turn long enough for the fluid in the ear canal to move at the same speed as the canal. A movement of the head in a different plane, such as looking at something in a different part of the flight deck, may set the fluid moving, creating the illusion of turning or accelerating on an entirely different axis. This action causes the pilot to think the aircraft is performing a maneuver it is not. The disoriented pilot may maneuver the aircraft into a dangerous attitude in an attempt to correct the aircraft’s perceived attitude. For this reason, it is important that pilots develop an instrument cross-check or scan that involves minimal head movement. Take care when retrieving charts and other objects in the flight deck—if something is dropped, retrieve it with minimal head movement and be alert for the coriolis illusion. As in other illusions, a pilot in a prolonged coordinated, constant-rate turn may experience the illusion of not turning. During the recovery to level flight, the pilot will then experience the sensation of turning in the opposite direction causing the disoriented pilot to return the aircraft to its original turn. Because an aircraft tends to lose altitude in turns unless the pilot compensates for the loss in lift, the pilot may notice a loss of altitude. The absence of any sensation of turning creates the illusion of being in a level descent. The pilot may pull back on the controls in an attempt to climb or stop the descent. 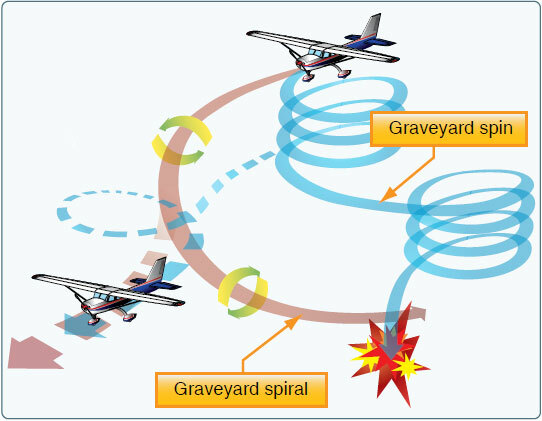 This action tightens the spiral and increases the loss of altitude; this illusion is referred to as a “graveyard spiral.” [Figure 17-5] This may lead to a loss of aircraft control. A rapid acceleration, such as experienced during takeoff, stimulates the otolith organs in the same way as tilting the head backwards. This action may create what is known as the “somatogravic illusion” of being in a nose-up attitude, especially in conditions with poor visual references. The disoriented pilot may push the aircraft into a nose-low or dive attitude. A rapid deceleration by quick reduction of the throttle(s) can have the opposite effect, with the disoriented pilot pulling the aircraft into a nose-up or stall attitude. An abrupt change from climb to straight-and-level flight can stimulate the otolith organs enough to create the illusion of tumbling backwards, known as “inversion illusion.” The disoriented pilot may push the aircraft abruptly into a noselow attitude, which may intensify this illusion. An abrupt upward vertical acceleration, as can occur in an updraft, can stimulate the otolith organs to create the illusion of being in a climb. This is known as “elevator illusion.” The disoriented pilot may push the aircraft into a nose-low attitude. An abrupt downward vertical acceleration, usually in a downdraft, has the opposite effect with the disoriented pilot pulling the aircraft into a nose-up attitude. Visual illusions are especially hazardous because pilots rely on their eyes for correct information. Two illusions that lead to spatial disorientation, false horizon and autokinesis, affect the visual system only. A sloping cloud formation, an obscured horizon, an aurora borealis, a dark scene spread with ground lights and stars, and certain geometric patterns of ground lights can provide inaccurate visual information, or “false horizon,” when attempting to align the aircraft with the actual horizon. The disoriented pilots as a result may place the aircraft in a dangerous attitude. The postural system sends signals from the skin, joints, and muscles to the brain that are interpreted in relation to the Earth’s gravitational pull. These signals determine posture. Inputs from each movement update the body’s position to the brain on a constant basis. “Seat of the pants” flying is largely dependent upon these signals. Used in conjunction with visual and vestibular clues, these sensations can be fairly reliable. However, because of the forces acting upon the body in certain flight situations, many false sensations can occur due to acceleration forces overpowering gravity. 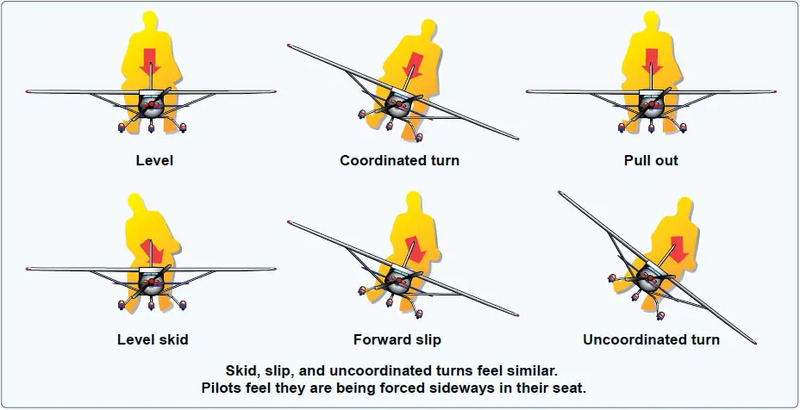 [Figure 17-6] These situations include uncoordinated turns, climbing turns, and turbulence.